Dubai: A convoy of nearly a dozen electric vehicles on Sunday set out on a road trip stretching through all seven Emirates. The four-day trip, undertaken by 40 enthusiasts and electric car owners and sponsored by green energy firms, is aimed to raise awareness of the technology. While most of the convoy is made up of high-end Tesla models, one car stood out: a lowly 2009 Volkswagen Golf station wagon converted to run entirely on electricity. Since March last year, Wiebe Wakker has driven his converted car 34,000 kilometres through 22 countries — all without using any money. The electric odyssey, which began in his homeland, the Netherlands, has seen the 30-year-old Dutchman rely solely on the kindness of strangers. “I zigzag my way around the world,” said Wakker, showing the back of his car, loaded with batteries and charging converters. A range of up to 200 kilometres is possible — with the air conditioning switched off. The conversion process saw the engine stripped out and replaced with a converter and electric motor. The transmission has been adapted to run only through second gear. Due to the switch from fossil fuels to volts, he claims speeds of 260 kilometres per hour are possible. But once he reached the UAE, his luck appeared to run out. Throughout his journey, he had to ask people along the way for a meal, a place to stay, and a power outlet to charge his car. “I was stuck here,” he said. “I travel without money. From here I need to get to India, to make my next step to Australia.” Due to visa restriction on certain states, Wakker has sometimes had to pay for the car to be transported by sea. However, help was at hand from the founders of the Global Electric Vehicle Road Trip, the organisers of this week’s trip. They offered him a job helping out at the event — a gig that gives him a cash injection to continue his journey. According to the firm’s founder, the UAE’s electric vehicle industry is still undeveloped. 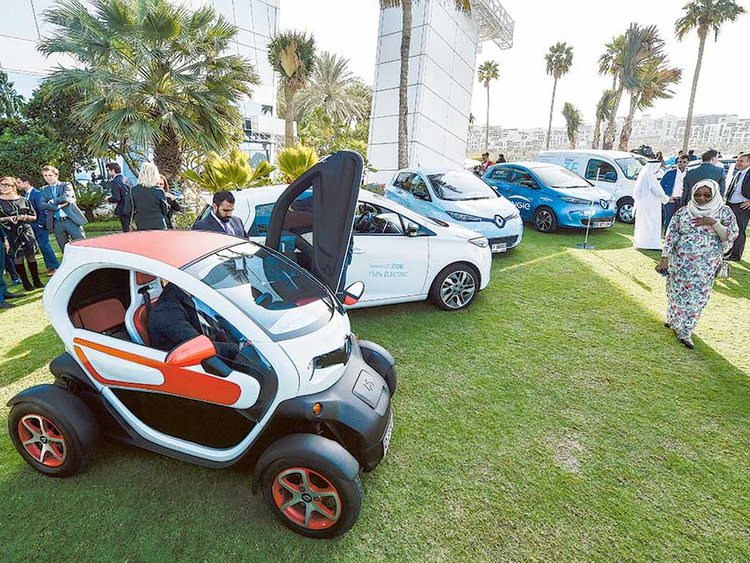 “The UAE is at a very early stage when it comes to the electric vehicle industry, when compared to other countries in Europe, for example,” said Ben Pullen. Very few electric cars are for sale in the UAE. The several dozen or so Tesla models — by far the car of choice by well-heeled electric vehicles, are all grey-market imports. For those who prefer to go by official channels, Renault sells its fully-electric Zoe in the UAE for around Dh120,000. The French marque also sells the two-seat Twizy for around Dh80,000. While there are still few options on offer, the infrastructure and awareness for electric vehicles is growing. From late 2015, Dubai’s Electricity and Water Authority (Dewa) set up 100 electric-car charging stations across the emirate. This week’s trip will see the launch of three new charging stations rolled out at hotels in Ras Al Khaimah, Fujairah, and Abu Dhabi. On February 1, the journey will end at the Sustainable City in Dubai, a green district located next to Arabian Ranches, with an electric vehicle conference and parade.